Timeframe: We ask that because this is The Gratitude Graffiti Project, that in the U.S. you do this within the 40 days before the national holiday of Thanksgiving. In 2013, the United States will celebrate Thanksgiving on November 28th. a. Do you have to do the project for forty days? No, but around Thanksgiving is ideal. We had chosen the magic number ’40’ to give people a chance to build up a habit of practicing daily gratitude and most people need 21-40 days of practice to begin a new habitual behavior and stick with it. The project is merely a catalyst to practice being grateful on a daily basis; to which doing the project for any number of days could be beneficial but 21 days would be highly recommended. b. What if we don’t live in America and do not celebrate a national thanksgiving holiday? 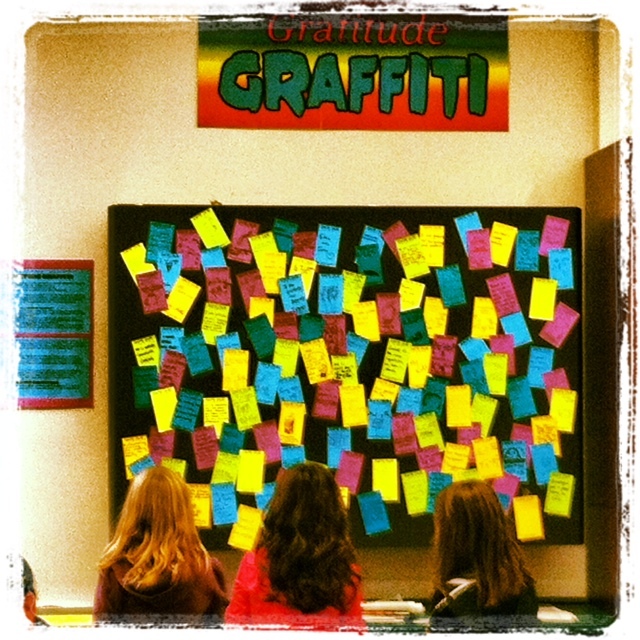 You can still start The Gratitude Graffiti Project any time of year. There are so many benefits to practicing daily gratitude and we support your efforts to create a healthier and happier community. Allow for people to write what they are grateful for, without censorship (unless they are writing comments that are inappropriate or offensive then feel free to intervene or monitor). If you would like to create a project in your hometown or community, please go to our ‘Contact Us’ page and we will send you all the information you need to get started. 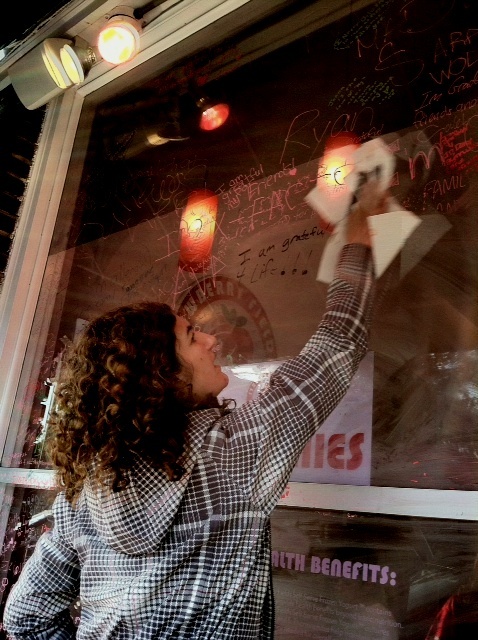 Lucila actually cleaning a window to make room for more gratitude. 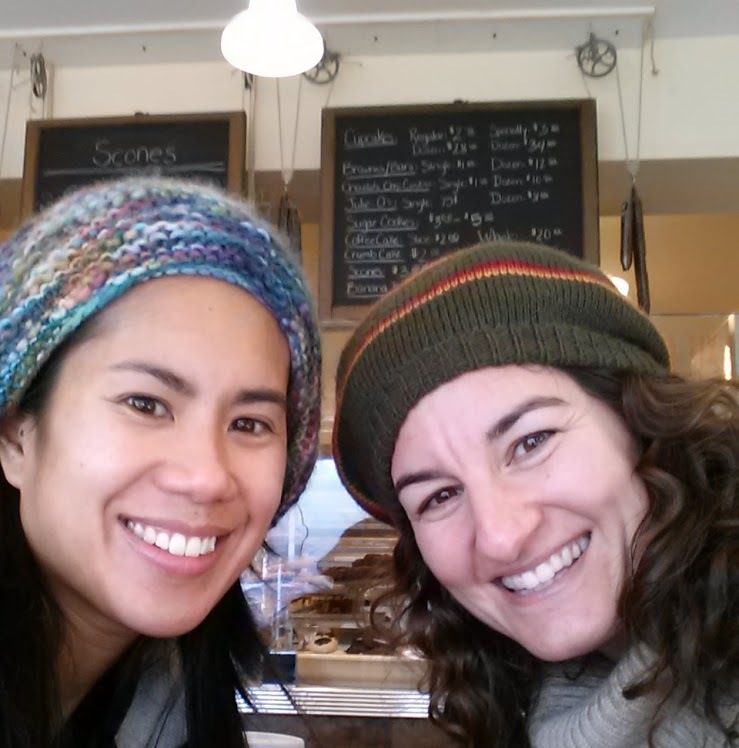 Stay connected: All you need is one store, coffee shop or library to get it started. And if there is just one more out there, that is terrific! Most of all we want you to HAVE FUN and experience the sense of community that this project creates. Please keep us posted on where you are, what store(s) are participating, and SEND US PICTURES! 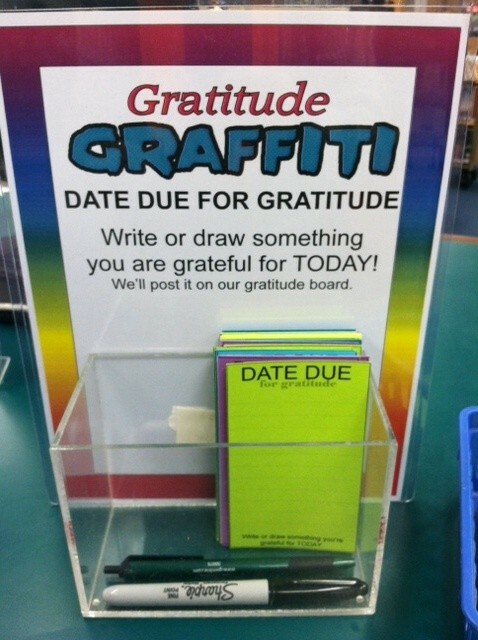 Post it on our Facebook page (www.facebook.com/gratitudegraffitiproject) and send us messages on our website: http://thegratitudegraffitiproject.com). We would love to promote and send traffic your way and offer assistance on how to create your own gratitude graffiti project website (just please link to us so that we know where you are and we can also provide you updates on the newest places and learn from each other as we go). If you have any questions or comments please contact us at thegratitudegraffitiproject@gmail.com. It was great to connect with you on the phone last week. Thank you for sharing and being so encouraging about this project. After we spoke at the Festival in Portugal, I came home and sent an e-mail to my family, asking them to join in on a family gratitude list. In preparation for our Thanksgiving gathering, we each listed things that we were grateful for in an e-mail and them sent them to each other. We did this for several days, and with each e-mail, it became clearer to each of us how much we had to be grateful for. 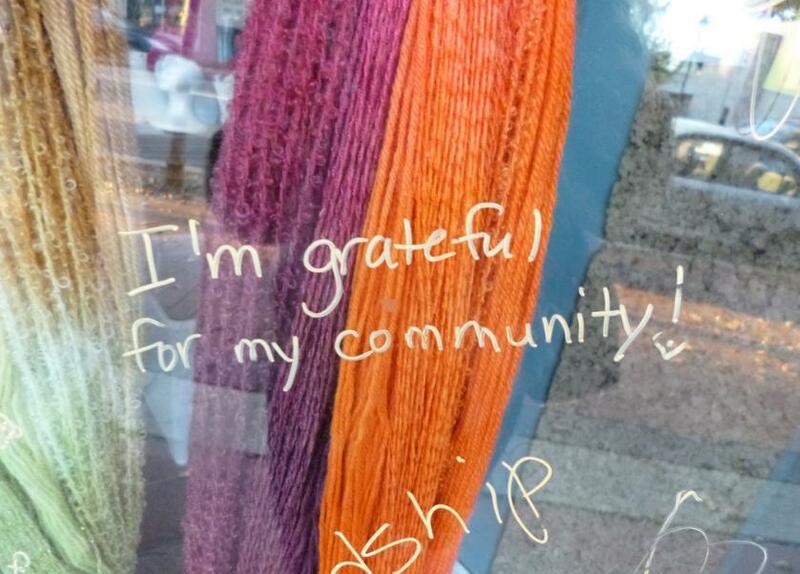 Recently I’ve introduced a gratitude graffiti project in my town of Milford, PA. My husband and I own an art gallery. 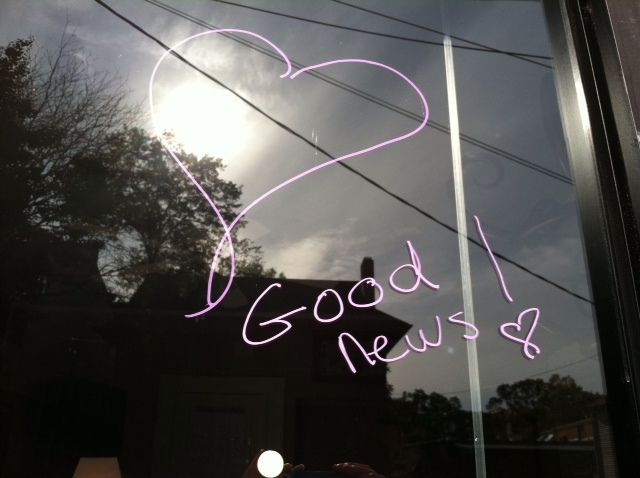 So I wrote on the window of the gallery, “What are you grateful for this season?” I provided erasable markers for our patrons to write on the window, and several people have participated so far. I will send photos in another e-mail, so you can share on Facebook. I’ve asked some of the other gallery owners if they would also consider doing this, and some are thinking about it too. Thank you for initiating and encouraging this wonderful project, it gives me great joy to consider the possibilities! This is amazing Joann! 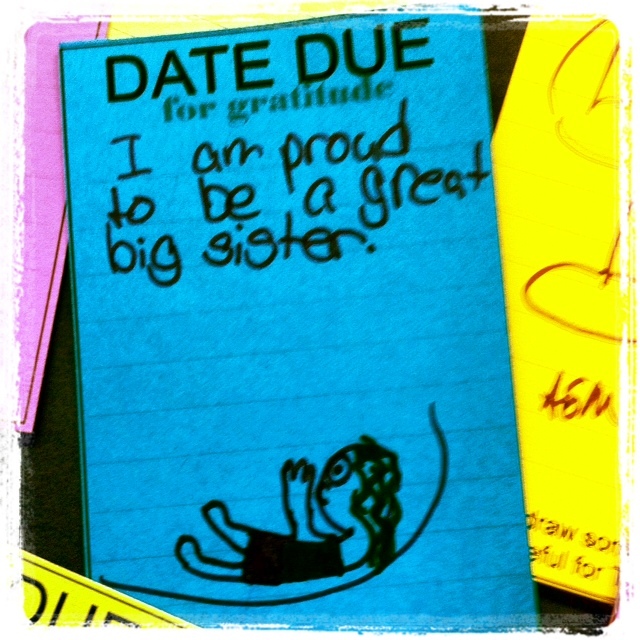 Thank you for taking this on and inspiring your community to practice gratitude. 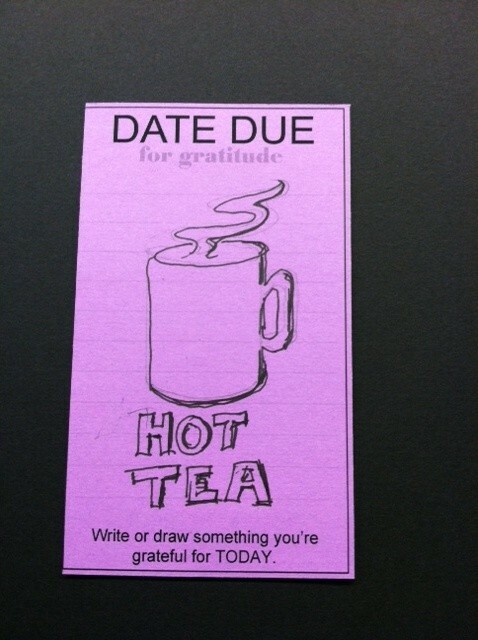 We are grateful for your effort! Please share pictures with us when you can! Sending you and your community lots of love. This project is being started in Grand Rapids Minnesota!